Enviva is bringing needed economic growth to rural communities across the American South, creating nearly 2,000 new jobs in less than a decade and pumping almost $1 billion into the Southern economy every year. At our plants in five Southern states, Enviva does more than make wood pellets – we help small towns participate in and benefit from the global economy. We produce sustainable forest products that meet 21st century needs. We connect local businesses to international markets through exports. And we help our communities preserve their environmental heritage, their local character and their quality of life. Enviva operates wood pellet production facilities in rural North Carolina, South Carolina, Virginia, Florida and Mississippi, and two deep-water marine terminals in Chesapeake, Virginia, and Wilmington, North Carolina. We also export pellets from ports in Mobile, Alabama, and Panama City, Florida. Collectively, these facilities represent an investment of more than $800 million. When our newest plant in Greenwood, South Carolina, reaches full production, Enviva will directly employ about 700 people. And according to studies by Chmura Economics, every job in one of our pellet production plants creates about two more local jobs in related fields such as forestry and transportation. Altogether, Enviva will support almost 2,000 jobs in the communities where we work. Enviva creates good jobs that pay well. Few positions in our pellet production facilities require an advanced degree, but the average salary in each one of our plants exceeds the overall average salary in the area where it is located. In some cases, Enviva’s salaries exceed the local average by more than 20 percent. Overall, Enviva generates almost $1 billion a year in economic activity. And Enviva’s local impact is especially significant. 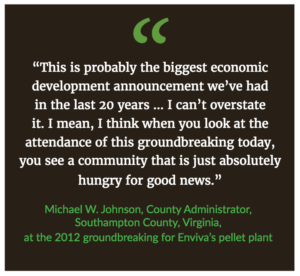 For example, Enviva’s pellet plant in Southampton County, Virginia injects more than $174 million into the local economy. Southampton County’s population is about 18,000. Enviva’s investments in the rural South stand in stark contrast to national trends. According to the U.S. Department of Agriculture, about one out of every four manufacturing jobs in rural America has disappeared since the year 2000. In the rural South, more than one in five families lives in poverty. And the rural population is declining as people move away and look for jobs elsewhere. But at Enviva’s facilities, American workers are tackling a worldwide problem, producing a low-carbon energy source that enables electric utilities to significantly reduce lifetime greenhouse gas emissions. And Enviva supports about 2,500 private landowners who choose to maintain their property as sustainable, working forests rather than converting it to commercial, agricultural or residential development.